According to a painting depicting a scene from the 17th century, a Native American man holds in his right hand a device that according to many is eerily similar to a modern-day Smartphone. Could this parting be evidence of Time travel? 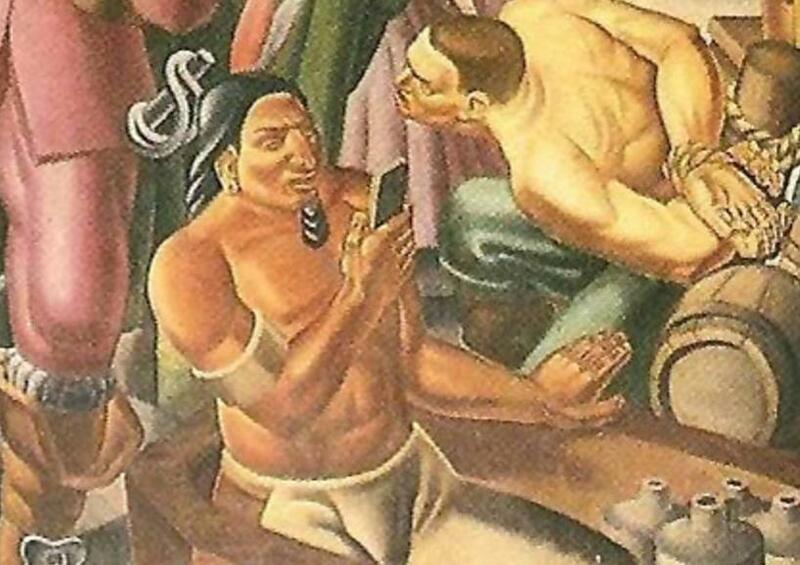 According to a scene drawn on a painting, a native American man seems to stare at an artifact that according to some is eerily similar to a modern-day smartphone. In fact, in the painting created in 1937, the native American man holds the ‘device’ while staring at it, and according to many, its as if he’s actually holding a smartphone. The painting—called Mr. Pynchon and the Settling of Springfield—depicts a scene from the 17th century. The man in the foreground is depicted with feathers on his head, wearing a white loincloth, but in his right hands, he holds a mysterious object. So what is the object being held by the Native American? According to historians, it’s ludicrous—and even beyond that—to think of time travel or evidence of smartphones used in the 17th century. However, Dr. Bruchac added how instead of being an actual smartphone, the object is more likely to have been an iron blade, saying that the painting was a ‘romanticized artistic genre’ which made it hard to tell. It ‘says much about modern American fantasies and fictions of Colonial White dominance vis-à-vis Indians’, she added. And while there are those who assume the device is in fat a smartphone, and it points to the fact that SOMEHOW certain people had the ability to travel back and forth in time, historian Daniel Crown argues that the object in question—which does resemble a smartphone—is in fact a mirror, widely used after its introduction in the 17th century. Iron blade, mirror, religious text or Smartphone? “To put it in the kindliest possible terms, Romano’s so-called ‘abstract’ aesthetic was willfully ambiguous,” said Crown in an email to Motherboard. “When Romano painted the mural, Americans were obsessed with the ‘noble savage’ trope. Given the scene’s focus on the founding of Springfield, Romano, in a reductive fashion, was probably trying to capture the introduction of modernity into a curious but technologically stunted community, which was instantly bewitched by Pynchon’s treasure trove of shiny objects.” added Crown. However, in addition to the possibility that it’s a mirror or an iron blade. The object may also have been a religious text. According to Dr. Crown, the item being held by the Native American may have been one of the gospels. “These did exist at the time and were roughly the same rectangular shape,” he said speaking to Motherboard. So there you have it, a controversial painting which according to some is evidence of iPhone and Android devices being held by Native Americans in the 17th century, and according to experts is just another ordinary painting that kick started the imagination of some, and that the object in question is just an iron blade, a mirror, or an ancient religious text.